As a first year teacher, I don't get much time to pamper myself, but when I do, I like to to all out! Lately, I have been setting aside one night a week to treat my self, & am loving the addition of these C.O. Bigelow products to my routine. I really appreciate that their entire selection of products is high quality, & smells great without being overly powerful. The lemon scent is a favorite of mine, & gets high reviews from the husband as well. I have been a believer of the C.O. Bigelow rose salve for YEARS! I think I discovered it during college (aka the lazy years! ), but it is my low-fuss way to stay moisturized all year long. I lather this stuff on all my body parts - lips, cuticles, dry elbows, you name it! It smells amazing, and really does the trick! You can now Shop CO Bigelow products and get 15% off! I have a friend who swears by their rose salve. I love their packaging too! Makes the whole bathroom look cute. I used to work at Bath & Body Works in college when they sold C.O. Bigelow products and I fell in love with everything from their line. 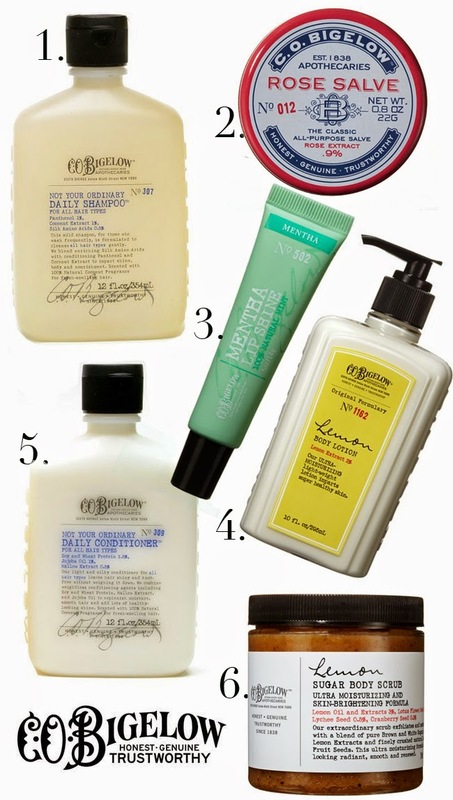 My personal favorite is the Dr. Galen Skin Tonic, but the lemon body butter and scrub line is a close second. Thank you for the amazing value and incredible knowledge you share on your blog.love you thisgreat blog,love you post.